The chart for the 1st controlled nuclear reaction, on 2 Dec 1942, has the Sun at 10 Sagittarius opposite a Saturn-Uranus conjunction at 9 and 2 Gemini. 8 to 10 degrees of Sagittarius-Gemini has proved very sensitive to transits over the years, and has since become known as the NUCLEAR AXIS. The astrology is impressive: the splitting (Uranus) of matter (Saturn) to create the energy which powers the Sun. OK, the Sun runs on fusion not fission, but it’s still from the heart of the atom. 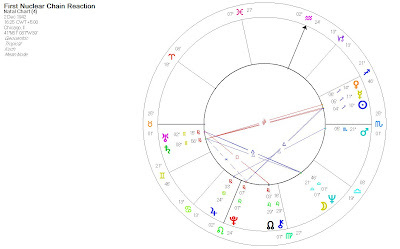 The chart for Hiroshima, the first aggressive use of nuclear power, has Mars at 11 Gemini - conjunct the nuclear axis. And conjunct Uranus. Astrology really does work! 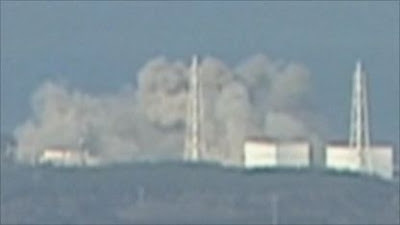 This morning there was a huge explosion at a Japanese nuclear power plant as a result of yesterday’s earthquake, the biggest recorded in Japan. And Uranus entered Aries last night. In an earlier edition of this post, I put the time of the explosion as 16:50. It was a fantastic chart, but unfortunately it turns out to have been 15:36! 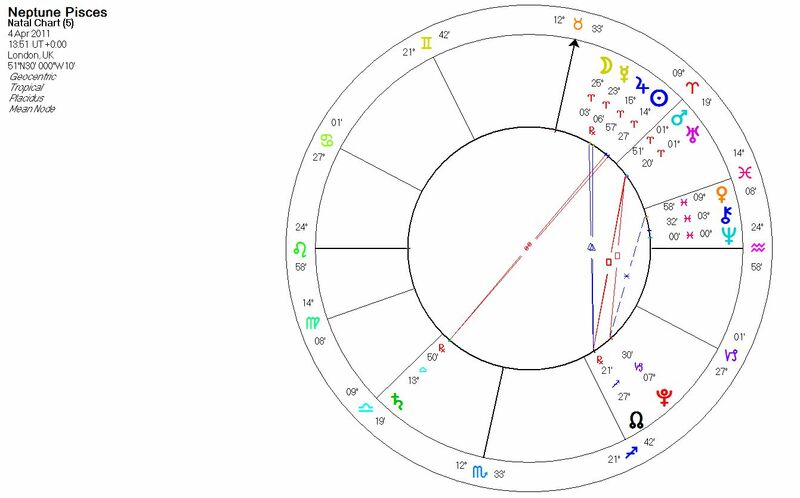 As you can see, the Moon at 13 Gemini conjoins the Nuclear Axis, and Mars at 13 Pisces (symbolising the explosion) squares both the Moon and the Nuclear Axis. The MC-IC of this chart (the line from top to bottom) conjoins the Asc-Desc (the line from left to right) of the Nuclear Chart. And the Asc-Desc of the Explosion Chart has the same signs as the MC-IC of the Nuclear Chart. That is significant symmetry. And here's a bit of a whopper: the Nuclear Mars at 21 Scorpio is opposite the MC of the explosion chart to within less than half a degree. Scorpio is secretive, so the explosion may well have been nastier than we think. So there is a lot of synastry here, making it is a very significant nuclear event. Officials are denying there will be a nuclear meltdown at the plant, just as they were denying there was much of a problem before the explosion. 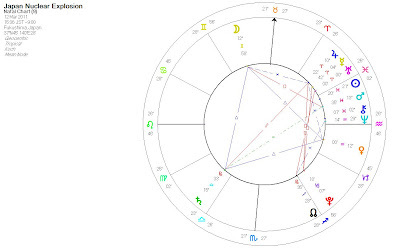 With the nuclear axis signified on the chart, as well as the other synastry, and with explosive Uranus having just changed sign into Aries of all places, further unfoldment seems likely. Since writing this, fears have arisen of a second explosion at the reactor. Astrologically, a meltdown cannot be ruled out. Again because the nuclear axis has been activated, the event is likely to have a major effect on nuclear policy. E.g. not putting nuclear power stations in an earthquake zone! The other 2 major nuclear accidents were 3 Mile Island in the US and Chernobyl in the USSR. 3 Mile Island (where a reactor went into meltdown) has the MC-IC at 5 Gemini-Sag, close enough in my book to be on the nuclear axis. And there was a New Moon in Aries, resonant of the Uranus Ingress into Aries theme of the Japanese explosion. Chernobyl, where there was both a contaminating explosion as well as a meltdown, has the MC-IC axis at 10 Virgo-Pisces, exactly square the nuclear axis; along the nuclear axis itself lies Chiron in Gemini opposite Saturn in Sagittarius. Chiron decribes the long-term damage to people and the natural world caused by Chernobyl and any other such leakages. We do not seem to be looking at another Chernobyl here, because the aspects to the nuclear axis are not as strong. Maybe not even a meltdown. But because of Japan's history, any nuclear incident has heightened significance. 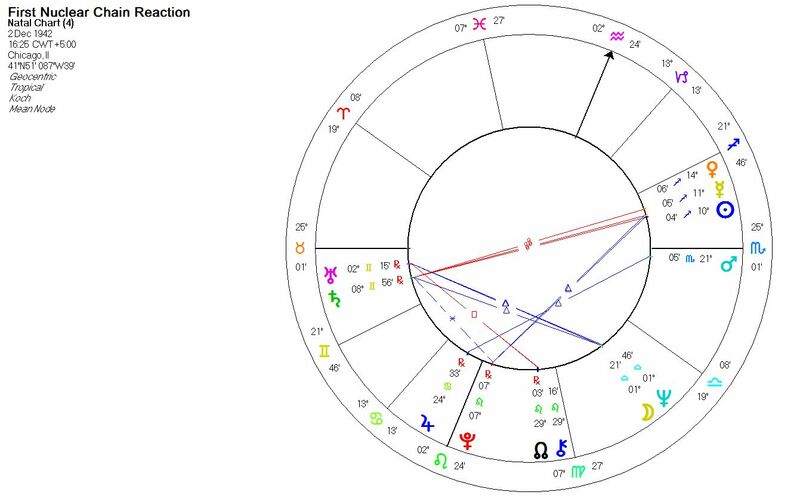 Chiron is conjunct the Desc on the Explosion Chart, so as with Chernobyl, we are probably looking at a degree of environmental contamination. 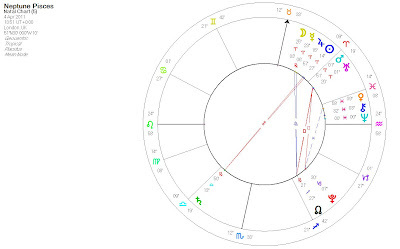 The wider symbolism of the times is the square from Uranus to Pluto, which will be within one degree in June, and became ‘in-sign’ as Uranus entered Aries. A hard aspect between 2 outer planets always indicates a time of profound change, a shift from one era to another. Uranus-Pluto well describes the earthquake that preceded the explosion: a sudden disruption (Uranus) from the depths (Pluto). Of course, you will always get earthquakes, but it seems more than coincidental that Japan should get the most powerful it has recorded as Uranus is being empowered by Pluto. 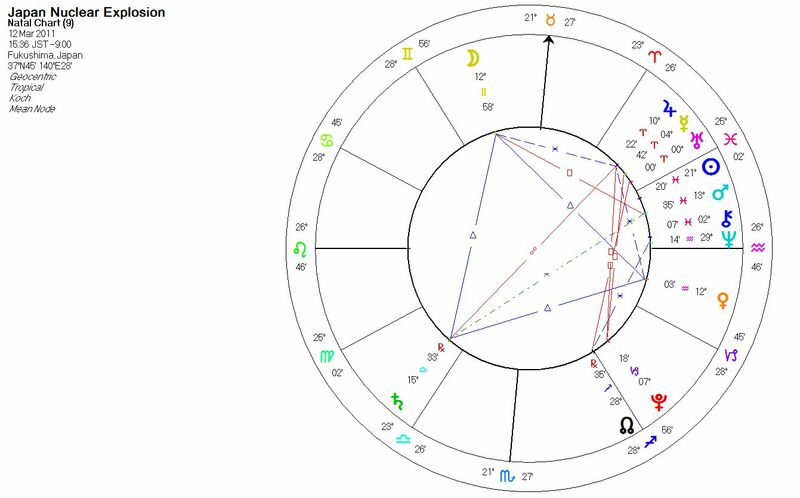 The symbolism and timing of events around Uranus has been extraordinary. First, with Uranus in its last day in Pisces, the ocean, you get a major earthquake out at sea followed by a Tsunami. The next day, with Uranus on its first day in the fire sign of Aries, you get a nuclear explosion as a result of that earthquake. I don’t usually pay that much notice to the exact movements of the outer planets. I look to the inner planets for that. But Ingresses – when a planet first enters a sign – seem to be something else. 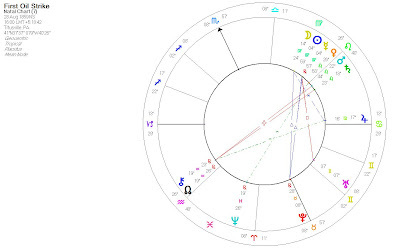 When Pluto, a planet associated with the economy, entered Capricorn back in early 2008, almost to the day the stock market began to lurch, as a prelude to the financial crisis that followed. Of course, the signs are, in a sense, nonsense. They were artificially constructed as 30 degrees each millennia ago, and have since slipped away by 23 degrees. But the fact that they work shows that reality involves a mysterious collusion between mind and matter. It shows that the outer world is much more a product of consciousness than one is led to believe. It is not the hard, ‘objective’ scientific world that we moderns believe it to be: scientific reality is just one more instance of the world seeming to conform to our presumptions about it. Neptune, the dissolver of boundaries, is the planet that describes this mysterious and fluid relationship between ‘inner’ and ‘outer’. 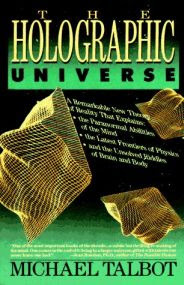 Reality is a hologram. Six planets, including a New Moon, in Aries. The transit of Neptune through Pisces is likely to involve dramatic changes in our underlying mythologies (which shape everything else). 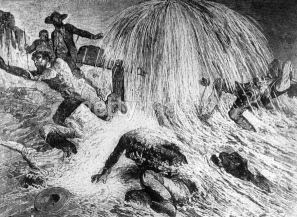 And a dramatic new phase in the history of our use of oil. Neptune rules oil, and the first oil strike occurred under Neptune in Pisces. The first oil strike also has Neptune in the 2nd house of wealth, showing how oil has become entwined with the world economy. And Pluto (wealth) in Taurus (wealth) on the Taurus IC (the depths of the earth). As Neptune moves into Pisces, so we are likely to see the first phase of our use of oil begin to come to an end. Neptune and Pisces are associated with lack of boundaries, and that certainly describes the unbridled way we have used this resource, as if it were limitless (Neptune), when it is not. In 12 years time Neptune will reach 26 Pisces, its position at the 1st oil strike. So that is the timescale of change we are looking at. All 3 outer planets are changing sign within a few years of each other: Pluto from 2008-9, Uranus from 2010-11 and Neptune from 2011-12. These are the 3 collective planets, so they show the world moving from one era to another. If you add into the equation an outer planet hard aspect in the form of Uranus square Pluto, then you have a double message of change, of a new era. This is the wider context in which the Japanese nuclear explosion has occurred. A very significant chart occurring in an era of major change. For the Japanese, the earthquake and the explosion have occurred as Uranus was squaring both the the Moon and the Asc of the Japanese chart. At present, all Uranus transits occur in the wake of a Pluto transit in the preceding few years. 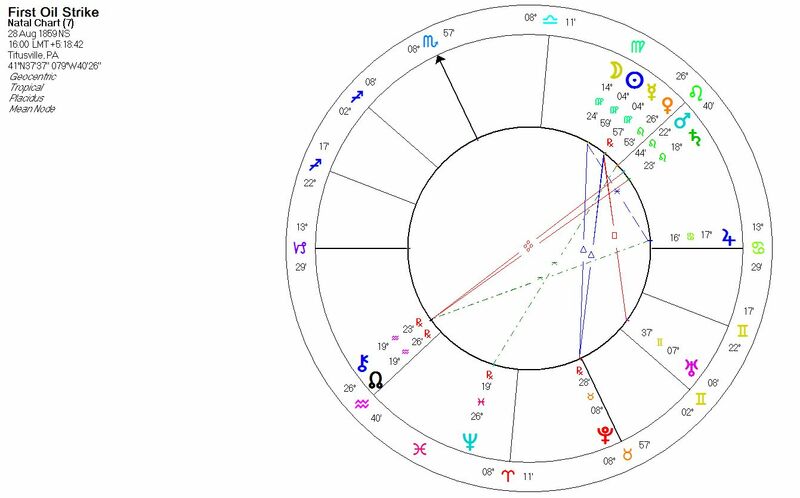 Pluto brings deep structural change, and Uranus brings sudden disruptive events that bring that deeper change to life: something that has been brewing beneath the surface for a long time becomes apparent. Japan has been stagnating economically for many years, and China is suddenly in its face as an economic and military threat after Japan’s many years as the world number 2 economy, under the military protection of the USA. Japan is due for change, and the events of the last 2 days could be a catalyst for that. Thanks for such a wide-ranging and insightful commentary. It seems to bring us all into this together. Excellent assessment, Mr. D! Thank you. Your penultimate paragraph, for me, is particularly important. The fine detail is interesting to look into after the event, but what you've pointed out in that paragraph is a broad prediction we need to be aware of. This is a fantastic article - thank you. the explosion chart is very interesting from a magical point of view. Overall your article is very interesting, very astute...impressed! and you are just down the road, literally, from me... so hello! Great observation and well put. I have been on your mailing list for a while now but with piece you really ‘nailed it’ as they would say on the X Factor. Cheers. Your description of this incident as a "nuclear explosion" is blatantly misleading. It was an explosion of hydrogen gas, just enough to tear out the thin metal cladding of the outer structure (not much more than a big shed, actually). Hydrogen explosions are relatively minor as explosions go, the gas is lighter than air so the explosion tends to go upwards (thus tearing off the roof). BTW, the official press release stated the time of the explosion as 3:36 PM local time. I think we all know it wasn't literally a nuclear explosion, but a major one at a nuclear power plant. But the time has indeed come through at 3.36pm, so it changes the MC-IC completely! However we are left with Moon at 12 Gemini on the nuclear axis, square to Mars at 13 Pisces, which also squares the nuclear axis. So it's not quite as significant as I thought, but the contacts with the nuclear axis still lend it significance. So sorry for thinking you were the Elsa lady. Any idea on the timing of the dollar's demise? And if the initial explosion was just steam, as they say.. that was not the point in time that changes things... if the reactor breached, then that moment would be the significant one. things are shifting and changing constantly over there at the moment... if you look up the usgs website, they are having almost constant quakes with numerous ones over 6.0. I think you are still right, and this is mark the massive change for Japan and possibly the world. Really good blogging. Thank you for your dedication. Excellent, well written and researched article. I greatly appreciate your dedication and generosity in posting your work for the general public. Great article. Humanity as a whole is due for a change and Uranus, harbinger of klieg light change, entered right on cue. When an earthquake of this magnitude rocks the earth, it sets the interior of the planet ringing, just like a bell. 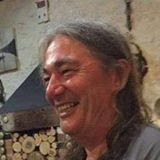 I think of Uranus' rise through the ocean depths of Pisces as the great enlightener stirring from his meditations and ringing a beautiful, brass tibetan singing bowl - very appropriate for a transition into the fiery (spiritual) realms of Aries. My heart and prayers go out to the people of Japan as they face a disaster of epic proportions. Everyone would do well to remember, "There but by the Grace of God go I." Does a country have "karma" - i.e., why have so many seemingly horrific things happened to Japan. You are absolutely correct in thinking that the world is in fact metaphysical. We experience that which we think or project. That is our reality in truth. The world is chaotic because our thoughts are chaotic. Many dreams but no truth. Not many seek the truth nor desire it, thus you cannot find it. Our experience here in the world is hellish, because we chose to compete rather than co-operate. The world is governed by fear & greed. It would be different if we had Love in our hearts and minds. We have bodies but we are NOT bodies. Creation is One, a unity.